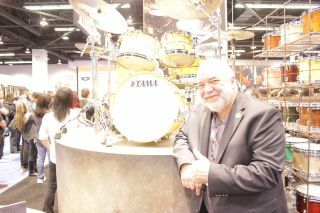 One of the major surprises of this year's NAMM show was the announcement that jazz great Peter Erskine had left DW and joined the Tama roster. Erskine could be seen at the show alongside his sparkling new Tama STAR kit, and Rhythm was on hand to get the lowdown behind the switch. What have you made of the reaction to the news? "There's been a lot of hubbub on the internet since the announcement. You hope for the most positive response and it has been that. The Tama fans strike me as a more cheerful, upbeat bunch of guys, they love Tama, I think that might account for some of the cynicism I've run into. The dumbest observation is that I've done this for the money. The move to Tama was not only predicated on discovering a drum set that makes me feel like a kid again, but also the fact I knew I could expect to have these drums when I travel to Europe or Asia. I had mixed luck with that with DW. Terrific people there, but their backline system was really set up for rock players. I hope everyone connected with DW will be glad that we got the jazz thing well along its way." "We did an AB test, well it was more of an A, B, C, D, E, F, G test with every drum set I could get my hands on. Immediately I noticed the STAR drums sounded better and were more fun to play. I was having to dig in with the other drums, but the tonal response for the Tama kit was better. All drums are created equal, but some rums are more equal than others. The bubinga shells are the thinest in the Tama line and they're beautifully made. They're handmade in Japan and I'm very fond of Japanese craftsmanship." "The Frequent Flyer is a terrific little drum set, I'm proud of it. It was insane of me to walk away from that, that was an artist drum set and one year after its launch I walked away from it. These Tama drums had to be that good to make me walk away. There was no financial incentive, it's insulting that people think that but I don't really give a s***. What is priceless is that playing these drums makes me feel like a kid again." Will you be involved with product development at Tama as well? "I'm known for favouring the flat-based cymbal stands from the old days. All I'll say in that regard is, stick around. Lighter hardware is something I've always been interested in so there will be a little bit of collaboration there, but otherwise I'm happy to sit back and play these drums. I won't re-create a travel kit, if people want that I can still recommend the Frequent Flyer. Tama has its own 18" bass drum kit as well, that's great too."